Click here for High Quality version of this photo. Jason Tardy presents a complete character education performance that will grab students' attention, while showing them the importance of setting goals and making positive choices. After performing at the White House on three separate occasions, and touring the world as a professional artist for over 20 years, Jason Tardy is living proof that a strong education, hard work and dedication is a direct path to a successful future. Jason combines his high energy juggling, physical comedy, and inspirational stories to create a performance that will inspire and astound your students. Drawing from his own personal experiences, Jason candidly addresses important topics such as bullying, making healthy choices, personal responsibility, and not being afraid to fail. From 1st grade to high-school, this show can be tailored to fit any grade level. Available for juggling workshops, block bookings, and residencies. 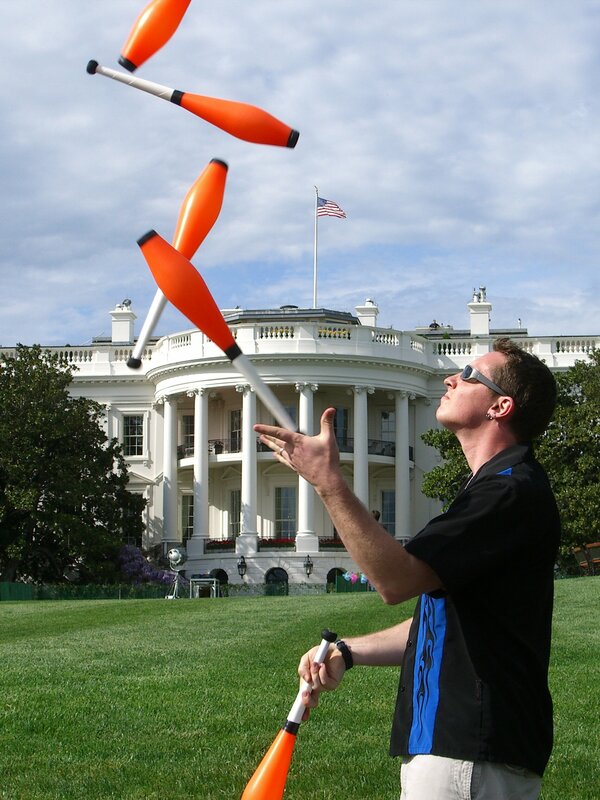 Jason Tardy: High Energy Juggling! "What an amazing act! Very engaging with the kids and adults alike. New and exciting material! A Non Stop Show! Very prompt, polite and easy to work with. He is coming back for 2019!" Jason Tardy's show is a combination of many years of relentless practice and virtually no social life. How else could he pull off standing on a yoga ball, juggling an ax, spiked mace, and toilet plunger, while reciting the alphabet forward and backwards at the same time? He also performs innovative choreographed juggling to music, fitting his body through a tennis racket, and if you trust him enough he will perform fire eating, fire breathing and fire juggling. Sometimes Jason is funny. Jason's multifaceted training, and over 24 years of experience in the performing arts has brought him all over the US and abroad. Some highlights include Disney Cruise Ships, the Atlantis Resort in the Bahamas, the Golden Phoenix Casino, and even The White House in Washington DC three times! "A Master of Physical Comedy!"